The Portable Radial Stacking Conveyor is equipped with a heavy duty undercarriage for stability, safety and support. 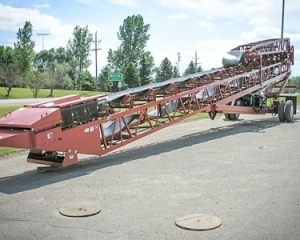 This conveyor is completely portable and engineered for the quickest transition from road to radial positions. Offering more options and more sizes than any other Radial Stacking Conveyor. We also offer a full range of Radial Stacking Conveyor Parts & Components.